The security system alarm activates when the doors, trunk, or hood are opened without the key, or remote transmitter. It also activates if you turn the ignition switch to ON after locking the doors with the remote transmitter. The horn sounds intermittently, and all the exterior lights flash. Unlock the vehicle using the key, or remote transmitter. The system, along with the horn and flashing lights, are deactivated. • The ignition switch is in LOCK 0, and the key has been removed from the ignition switch. • All doors are locked with the remote transmitter. • Opening the trunk with the release button on the driver’s door or the emergency trunk opener. 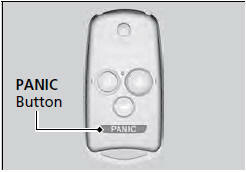 If you press the PANIC button for approximately one second, the following will occur: • The horn sounds. • Some exterior lights flash for about 30 seconds.